This week’s weather forecast is perfect for attending downtown Bellevue’s Live at Lunch summer concert series. Bring your lunch and don’t miss this week’s performances. Concerts continue every Tuesday, Wednesday and Thursday through September 8th. 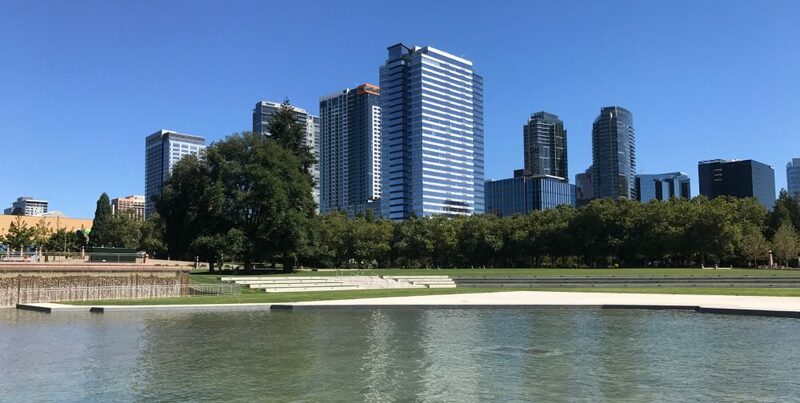 The high demand for housing in Bellevue has created a robust real estate market, driving sale prices for houses and condos and residential rents up in recent years. It was great news when the King County Housing Authority announced last week it had reached an agreement with local builder Intracorp to purchase the Highland Village apartment community and preserve the apartments as an affordable place to live in Bellevue. Intracorp, the developer who purchased the Highland Village property, had submitted plans to redevelop the property’s 76 affordable apartments into 87 townhomes selling between $650,000 and $900,000. The KCHA agreement with Intracorp to purchase the property will preserve the Highland Village apartments as affordable housing, allowing existing families to continue to live in the community. (Intracorp will sell the property to KCHA for below appraised value.) After the acquisition of the property KCHA will renovate the property over the next two years, keeping rents at or near their current affordable levels. Finding and preserving opportunities for affordable housing is a goal of city, county and state governments. Preserving Highland Village will allow these families to maintain their homes where there is access to quality schools, employment and public transit. For the past several weeks Pokemon Go has brought thousands of people outdoors to search for Pikachu, Ash, Psyduck and Mew, to name a few. Dozens of people are gathering in public places, discovering buildings, parks and artwork they never knew existed before, talking to neighbors they hadn’t met before and maybe shedding a few pounds in the process! Granted, with hundreds of people swarming the Downtown Park, the craze has created some complaints about late night noise, but overall the civic engagement that has occurred has brought people outside on to the sidewalks to explore their city. While I haven’t yet joined the Pokemon Go community, players I’ve talked to have said they’ve learned more about the city’s parks, artwork and street-scape in the last few weeks than they knew before, even if they’ve lived here for years. The increase in civic engagement is a plus – more people out on the sidewalks is a good thing, for safety, vibrancy and economic activity, bringing people in to restaurants and coffee shops. Some cities, capitalizing on the craze, are promoting the locations of their PokeStops to bring people outdoors. Remember . . . watch where you’re walking and don’t drive and Pokemon. Its easier (and safer) to spot Pokemon while riding the bus.